The Theodul Glacier (German: Theodulgletscher) is a glacier of the Pennine Alps, located south of Zermatt in the canton of Valais. 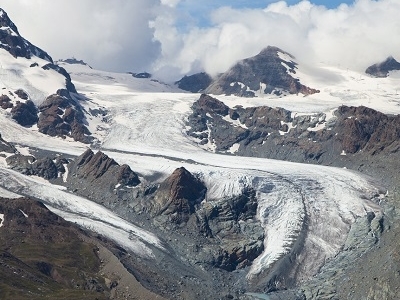 It descends from the west side of the Breithorn and splits into two diverging branches: the Oberer Theodulgletscher and the Unterer Theodulgletscher, both part of the Gorner Glacier and Gornera river basin. 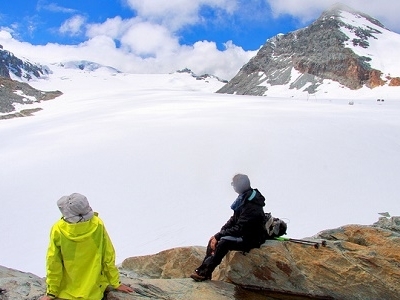 Slightly above the glacier splitting is the Theodul Pass, crossing the border between Switzerland and Italy, and connecting Zermatt to Breuil-Cervinia. Most of the glacier is part of the ski area, marketed as Matterhorn Glacier Paradise. Several lakes formed at the bottom of the Oberer Theodulgletscher, west of Trockener Steg. The largest, the Theodulgletschersee is 7.7599 ha wide and lies at an elevation of 2,851 metres above sea level. 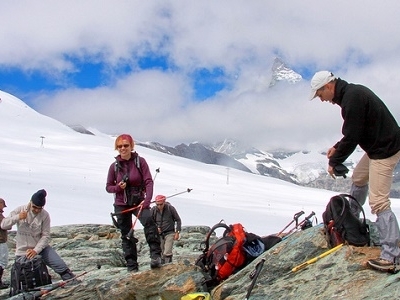 Here's the our members favorite photos of "Glaciers near Pennine Alps". Upload your photo of Theodul Glacier!